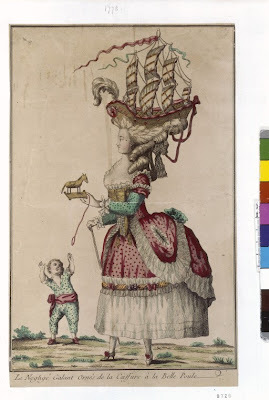 There is a tradition that these images depict Marie-Antoinette, and some historians have even claimed that they were circulated to publicize her shameful extravagance in the face of a very real military and economic threat. While the queen clearly had no objection to wearing elaborate confections on her head, and these may have included ships, there is absolutely no evidence to support either the identification or the interpretation. On the contrary, ship hats formed part of a much wider expression of French support for the American cause. They were worn by many women, if only for a short period of time. Some may have questioned their taste, but in political terms they were perceived as being patriotically anti-British rather than problematically extravagant or anti-monarchist. France’s fascination with America transcended fleeting fashion to have far-reaching consequences for both countries. Not only did the success of the American Revolution encourage the French people to throw off their own yoke of arbitrary power, but the debt the French government incurred in support of the American cause destabilized the economy to the point that this second revolution was unavoidable. The French Revolution forever colored our view of the politics and propriety of wearing ships as hats. It wasn’t until after 1789 that the coiffure à la Belle Poule was added to the list of Marie-Antoinette’s transgressions, in heavily fictionalized memoirs of the ancien régime. Thus, the all-American, pro-democracy style was transformed into the sartorial equivalent of “let them eat cake”—another apocryphal but persistent piece of misinformation about the queen, which has persisted precisely because it so perfectly fits our received notions of her selfishness and naiveté.